Many thanks to the Keene Sentinel for their great article on the front page of the Sports section in today’s Sunday paper. It nicely promotes the open house happening today down at Petersham Curling Club and also mentions the work we are looking to do to bring a dedicated curling facility to Keene and the Monadnock region. The online article strangely didn’t include any photos, but the print version has a few great photos. 1. Visit the Petersham CC Open Houses – The closest place to curl right now is the Petersham Curling Club and to make curling a reality in Keene we need to build a group of people who know how to curl and want to make it happen here. So please do check out the PCC open houses today from 12-5 and on this Thursday, Feb 20 from 6-9. If you’d like to do more, please join the PCC and also check out their upcoming “Learn to Curl” sessions. 2. Fill out our interest form – Even if you’ve never tried it and just think it looks interesting, we need to get a sense of how many people are interested in the sport of curling. We’re also definitely looking for people who would be interested in helping us build the organization in many different ways. 3. Spread the word! 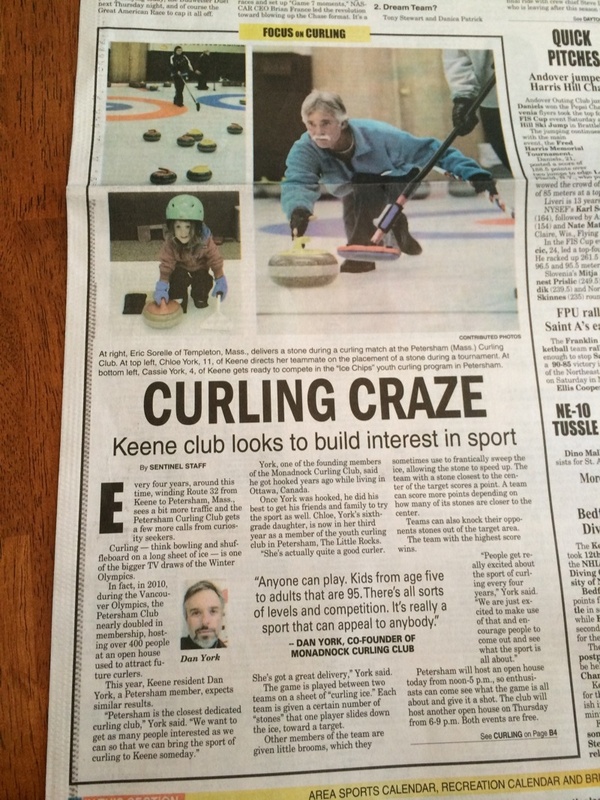 – Please help us spread the word that there are people who want to bring the sport of curling to Keene and the greater Monadnock region. Tell people about the website… follow us on social media (and share/retweet our info)… invite us to come talk to your group (we can explain curling! 🙂 )… just let people know we’re here! Thank you for visiting – and let’s bring curling to the region! 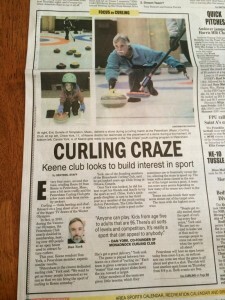 This entry was posted in About Monadnock Curling Club, News on February 16, 2014 by Dan York.